Targeting case studies: we currently have 11. 1upsearch, a digital marketing agency based in Bedford, UK, needed a powerful website analysis tool to help drive ROI for their customers. To achieve this goal they set up Google Website Optimiser experiments. This allowed them to run tests on websites of different shapes and sizes, with Website Optimiser consistently providing the insight to make the website better. Following the experiments 1upsearch implemented the winning site variations. The result has been clear, as the agency achieved a 20% improvement in conversions for one their largest clients. Microsoft Advertising’s behavioural targeting technology ensured a high performance launch for Vauxhall’s new Insignia, steering ads directly to those actively engaged in researching auto purchases. 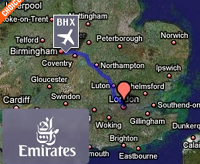 "Emirates is the only long haul airline to fly from 6 UK airports. Despite this, most people still associate mid and long haul flights for business or pleasure with Heathrow or Gatwick. Miles Better used geographic and behavioural targeting coupled with in-advertising mapping to encourage people to fly from their local airport. It demonstrated the ease of getting there by plotting a route and showed how quick the trip would be. The campaign was part of the 6 UK Airports strategy that combined brand led comms, direct response offers, and even brand utility applications to increase passenger numbers for Emirates flights at Newcastle, Birmingham, Glasgow and Manchester."